The Guild of All Souls The Catholic Revival within the Church of England during the 19th century took hold in local parishes through the creation of devotional societies and sodalities. 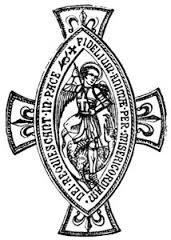 The Guild of All Souls was founded in 1873, with an American Branch being established in 1889, with the purpose of setting forth the two great doctrines of “the Communion of Saints”, and “the Resurrection of the Body”. Members of the Guild pray regularly by name for the departed, offering the Holy Sacrifice of the Mass with special intention for the repose of their souls. Time spent in prayer and intercession for both the dying and the dead is never a waste of time. In so doing, are truly helping those who in their day loved, lived and proclaimed the Catholic Faith and Life, which should be the inheritance of every Christian. In keeping trust with them, we too may share in its fullness the Faith we have received with those of our own generation. Throughout the year there are many souls remembered by the Guild in prayer at the Mass who have worshipped and served God here at St. James in their day, and are now at rest in the Peace of Christ, who is “the Resurrection and the Life”. To assist us in this good work, a Requiem Mass is usually offered at St. James on the 4th Saturday of each month at 10:00 in the morning. Please see our calendar for details.